A wedding day should be a glittering occasion and most brides love the idea of accessories for their special day. There is no shortage of jewels and gems to adorn your outfit or theme of your wedding, and an increasingly popular addition to many wedding day outfits is the bindi. Traditionally associated with Asian weddings, this discrete yet stylish addition has become more and more common in the UK wedding day, adding a touch of glamour and promise to any wedding dress or look. This jewel adds the perfect finishing touch to a wedding invitation that informs your guests about your wedding in an elegant and classic way. The scroll text provides a sense of tradition and grandeur which many couples are looking to create around their wedding. This is a wedding invitation that gets to the point, but does so in an interesting and stylish manner. The text on the card comes in a host of ink colours and the bindi can be matched to the ink colour, creating a unified theme for the invitation. Again, if you have a theme for the wedding, you will be able to present this theme at all stages of the wedding process, including your invitation. There is a host of additional stationery items that come alongside this card so if you are looking to use this theme throughout your big day or in planning for the big event, you can do so. With the option to fully customise the text, he raised ink creates a unique card, one that delights your touch as well as your vision, making sure that this is a wedding invitation that your guests will love to receive. 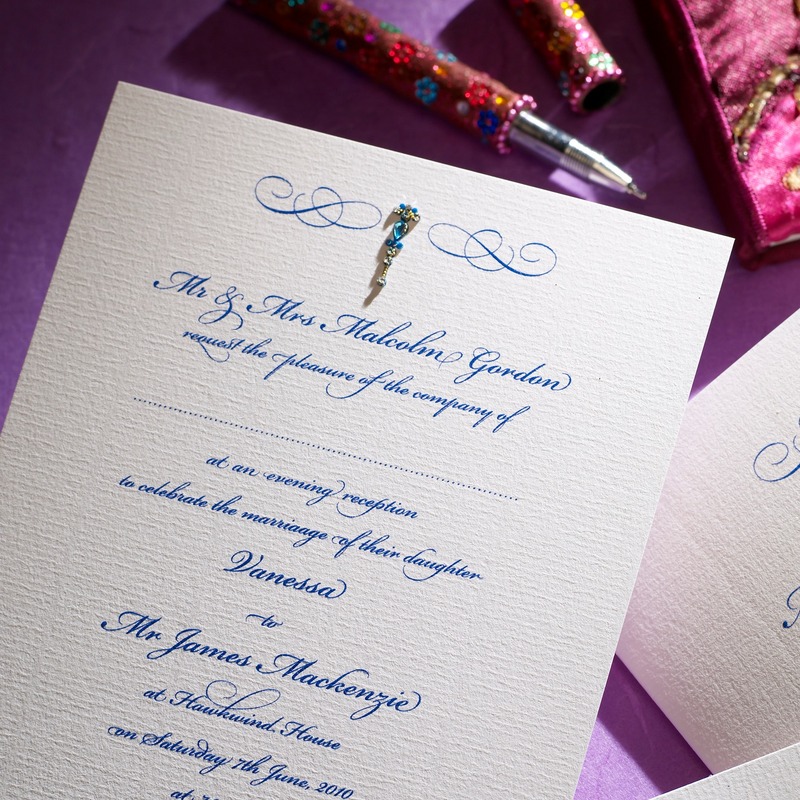 The Jewel invitation from The Letter Press of Cirencester is shown here in delft blue ink on a 5×7″ Brilliant white laid card with a blue bindi jewel positioned between the decorative flourishes at the top.